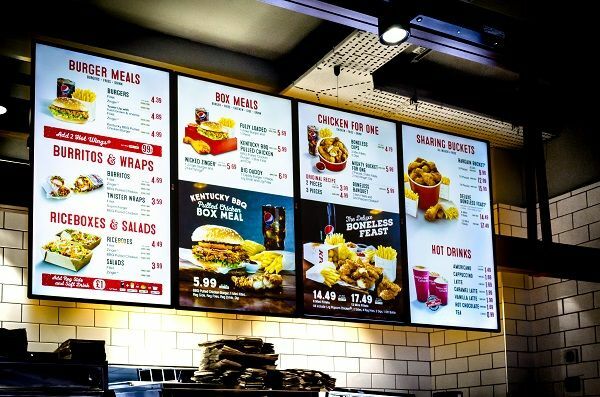 Menu Board Design - MY SOLUTIONS MCR LTD.
For fast-food restaurants, a benefit is the ability to update prices and menu items as frequently as needed across an entire chain. Digital menu boards also allow restaurant owners to control the dayparting of their menus, converting from a breakfast menu in the late morning. Typically, fast-food restaurants and cafeteria-style establishments provide their menu in a large poster or display board format up high on the wall or above the service counter. This way, all the patrons can see all the choices, and the restaurant does not have to provide printed menus. This large format menu may also be set up outside. The simplest large format menu boards have the menu printed or painted on a large flat board. More expensive large format menu boards include boards that have a metal housing, a translucent surface, and a backlight (which facilitates the reading of the menu in low light) and boards that have removable numbers for the prices. This enables the restaurant to change prices without having to have the board reprinted or repainted.